Sindh province is located in the sub-tropical region of the world where summers are extremely hot while winters are mild. Located at 24.87°N 67.05°E, the province experiences south-west monsoon from July till August. Climatically, Sindh is divided into three climatic zones into Siro, Wichola and Lar. Siro mainly consists of upper parts of the province including Jacobabad. Wicholo consists of central parts of the province including Hyderabad while the Lar region is mostly based on the coastal parts of the province including Karachi. In the year 2011, a total of six monsoon spells hit the province. The first spell in July was caused by an upper air cyclonic circulations while others in August and September were caused by severe dense low pressure systems. The floods of 2011 have been compared to the 2003 Sindh floods, in which severe rainfall continued for weeks. Most of the rainfall occurred during the neutral conditions while the last two spells occurred during weak La-Nina phase. A total of sixteen districts were affected by the torrential rainfall in the province of Sindh, the rainfall that fell over the province was estimated to be over 37 million acres feet in just four months, these were the highest-ever recorded monsoon rains and the area had never seen such powerful level of precipitation since many years. During the first two months of monsoon season (July & August), anomalous behavior of precipitation was observed over Pakistan. In July, below normal (-72%) rain was recorded in Sindh. The above normal monsoon activity was observed during August over the country, especially southern Sindh, where monthly rainfall was (+270%) above normal. 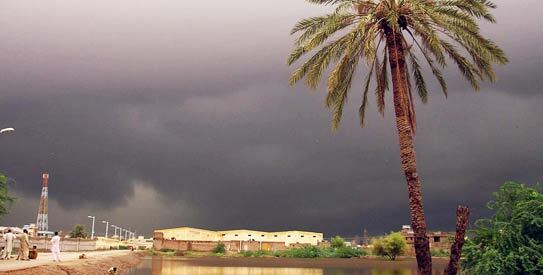 Monsoon season in Sindh generally starts in the from July till late August but during the monsoon season of 2011, precipitation started from late July and continued till mid-September. 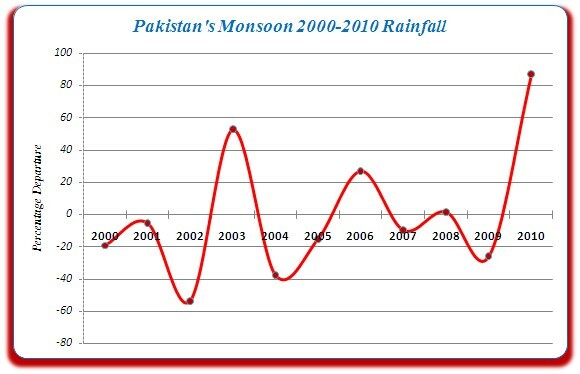 In 2010, the monsoon rainfall were 87% above normal in Pakistan and was highest since 1994 and ranked second highest during last 50 years of period. In 2011, the monsoon rainfall in Sindh was alone 270% above normal, which were the heaviest recorded during the period 1961-2011. Before the start of torrential rainfall in Sindh, the province was under drought-like conditions especially in the monsoon month of July and with no major rainfall since last year’s (2010) rainy season that is twelve months. These torrential rainfall caused 434 deaths in the Sindh province with 8.9 million people affected. While 1.52 million homes were damaged and 6.79 million acres land damaged as well. Monsoon changing pattern – Climate change to be blamed! According to the Pakistan’s Asian Development Bank (ADB), monsoon winds are likely to become frequent over northern Pakistan thus leading to a repeat of 2010 floods, a UK-based climate change expert has also said similar things. Due to climate change there will be an exceptional change in the temperatures in Pakistan in the coming years but the province of Sindh would be less affected as compared to the other provinces of the country. Climate change will impact the monsoon pattern over the country that would cause the monsoon winds to shift more westwards closer to Indus basin, moving away from the Indian state of Rajasthan. In the next 20 to 30 years, severe monsoon rainfall are expected according to some scientific calculations in the southern parts of Pakistan. Due to rise of pollution, frequent cyclones are expected in the Arabian sea as well that is a cause of worry for the countries situated near the Arabian sea. Pakistan Weather Portal (PWP) conducted a poll on December 27 and majority of the people believed that climate change is a threat to Pakistan. It was surprising to observe this because in the middle of 2011 a local newspaper published a poll that showed the most Pakistani do not believe that climate change is a threat to the country. A cause of great worry or not? Though it is not clear whether climate change is happening due to human activities or it is Earth’s natural cycle but we do know that it is dangerous for human beings. Extreme weather events in Pakistan has become a yearly phenomenon in the country because past records have shown that frequency, intensity and magnitude of such events that includes floods, droughts, cyclones and earthquakes all have become frequent, a clear indication climate change is happening which is a cause of worry for the citizens of Pakistan. ← What is climate change? – Pakistan in focus!